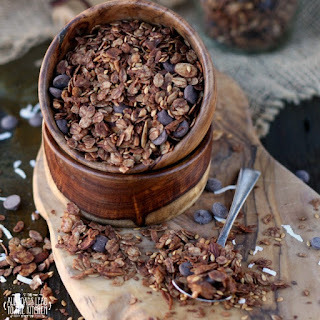 This granola (and what goes into it) is something that I've been wanting to share with you since October! With its double-dose of chocolatey goodness laced with fragrant peppermint, it is perfect for the holiday season. I mean, chocolate and mint is a great year-round combination, but there's just something about it that screams winter to me. Normally I'm a granola for breakfast kind of girl, but this version tastes so sinful that you'll totally want to eat it for dessert—which is the first reason I'm sharing it with you during Christmas Week (which is all about the sweets). The second reason is that it makes a perfect homemade gift when stored in a pretty jar or container wrapped with a ribbon. Best of all...it's pretty much the easiest thing in the world to make. When I first tried this recipe back in October, I was at a pretty awesome blogger event put on by Meijer. If you're not from the Michigan-Indiana-Illinois-Wisconsin-Ohio area (the area I affectionately call "my midwest"), Meijer is a supermarket that got its start in Greenville, Michigan 81 years ago. I grew up in Grand Rapids (home of Meijer headquarters) which means that I grew up in that store. It's still one of my favorite places to shop; they have gorgeous produce and support local farms, their meat and seafood counter offers amazing selection, and their "house brand" is both affordable and high quality. That's actually one of the things we talked about at the event. Meijer recently relaunched their own line of products. 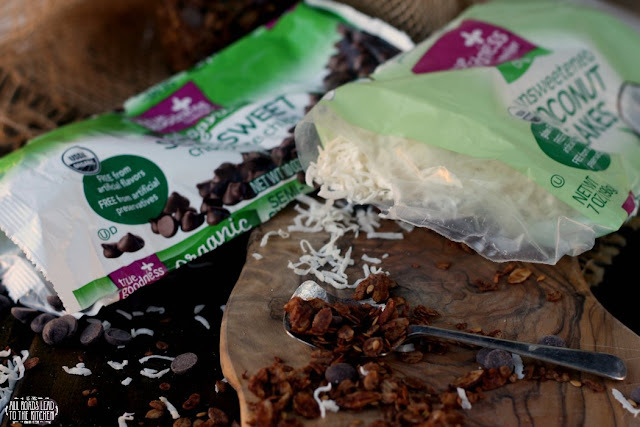 Formerly known as Meijer Organics and Meijer Naturals, they've merged into one label—True Goodness by Meijer (with their organics being labeled True Goodness Organics). With beautiful new packaging on the outside and the same high quality products on the inside, Meijer shoppers are one lucky bunch. One of my favorite products is Meijer True Goodness unsweetened coconut. It's always been a bit tricky locating unsweetened flakes, and it's rare that I want the sickeningly sweet and sticky kind, so it made my day to find out that I can pick up a pack of it anytime I want to now. So, whether or not you have a Meijer in your area, you definitely need to pick up the ingredients to make a big batch of this double chocolate peppermint granola this holiday season. Give it as a gift and/or start your morning off right. Bring the flavors of the season to breakfast (or dessert) with this peppermint infused double chocolate granola packed with nuts, seeds, coconut. 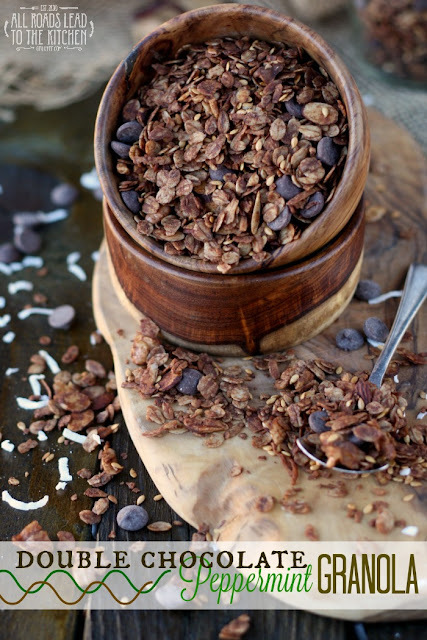 Combine the oats, coconut flakes, almonds, walnuts, flax seeds, cocoa powder, and salt in a large bowl. Combine the melted coconut oil, maple syrup and peppermint extract in a glass measuring cup, then pour into the bowl with the dry ingredients and stir until everything is coated and combined. Turn out onto the prepared baking sheet and spread out evenly. Slide into preheated oven and bake for 60 minutes, stirring 3 times throughout the baking process. 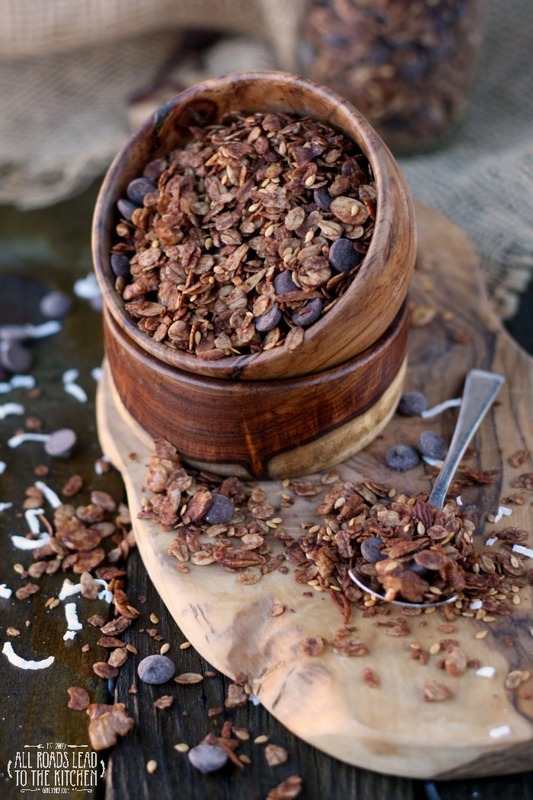 Allow granola to cool completely, then stir in the chocolate chips. Store cooled granola in an airtight container at room temperature.